Sometimes you stumble across a portfolio where the artist only has a couple of comic based pieces, other times there can be just one work so brilliant, you'd risk being stoned to death by fellow art lovers for putting something else beside it. These are Random Works of Wow, and illustrating the point this week is artist Levi Hoffmeier with Cyclops. It takes a special kind of artist or writer to make Cyclops sing as a character to me, and with this drawing Levi has him busting octave barriers all over the show. Look how serene yet powerful he looks, just through pose and colour alone! 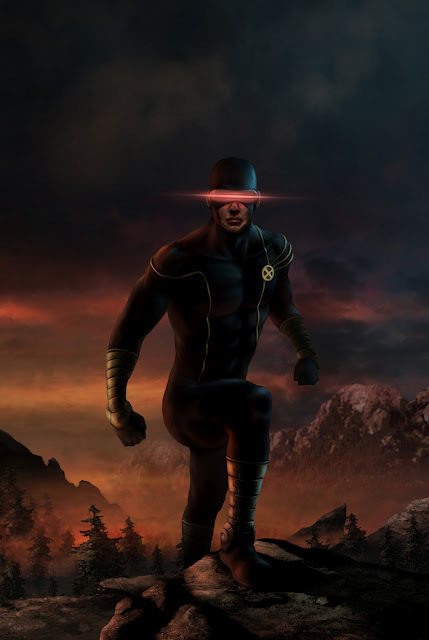 Digitally painted "wandering about the Alaskan wilderness" Scott Summers stands as the dedicated soldier at the heart of the X-Men. What do you think? Sound off below or to view more of Hoffmeier's sense-stunning work, click the jump. I know right Craig, somehow I think that would even give Wolverine pause before going up against Cyke like that!